Coffee scrubs have been popping up all over the Internet these days so I was excited when Jealous Body Scrub asked me if I'd like to try their product. 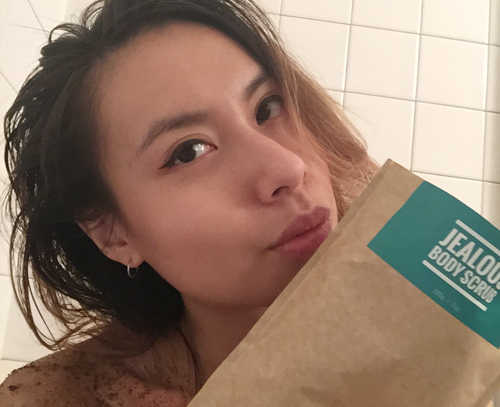 Not only was this my first foray into the world of coffee scrubs, but the company is also based in Vancouver and you know how much I love supporting local businesses! 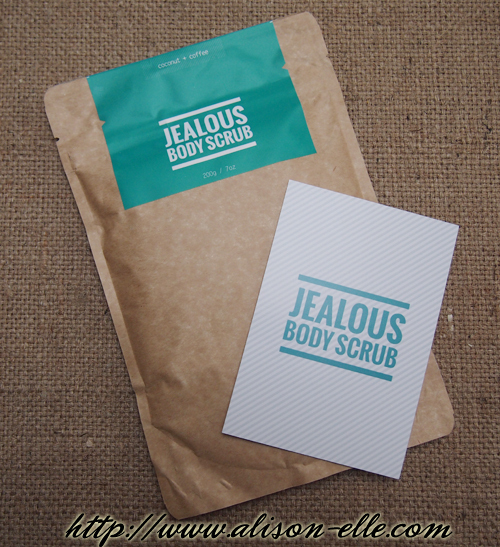 One package of Jealous Body Scrub costs $17.95 and is made with 100% natural ingredients: premium Robusta coffee grounds, organic cold-pressed coconut oil, raw brown sugar, sea salt, vitamin E, and minerals to protect and repair the skin. The combination of these ingredients smells absolutely delicious. When I first opened the package I seriously could not stop sniffing it. The company claims the product will reduce the appearance of cellulite, eczema, stretch marks, age spots, varicose veins, psoriasis and acne. However, you don't have to worry about dryness either as the cold-pressed coconut oil hydrates your skin at the same time (a lot of people use coconut oil as a moisturizer so this is no surprise). If you're interested in learning about how all the ingredients work, I suggest reading these FAQs, as Jealous has done a far better job explaining things than I ever could. As for usage, this product should definitely be used in the bath or shower because it is messy. You wet your skin first so that the scrub actually sticks and rub it in circular motions, leaving it on for 5-10 minutes so it has time to do its work... After rinsing the scrub off, skin is left feeling super smooth and moisturized. I can see getting addicted to this for sure.